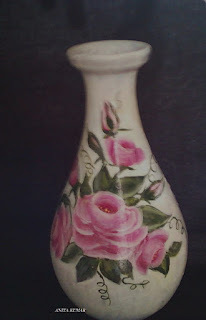 Welcome to my blog of decorative crafts! 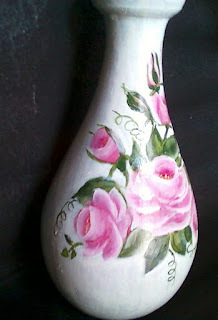 One Stroke painting technique paired with Acrylics can work magic even on the most dull and boring items around the house.Its amazing to see a dull clay pot turn into a work of art before your eyes within a few hours. 2 Acrylic paints, brushes, rags for wiping the brushes. 1 Spread newspaper over the work area. 2 Wipe the pot , if possible rinse it and dry overnight. 3 Sandpaper the pot to even out rough surfaces. 4 Use Acrylic paint to paint the background.Double coat , dry between coats. 5 Select a design keeping in mind the shape of the pot while the pot dries. 6 Use a carbon paper to trace the design. 7 Select color scheme for flowers/fruits , leaves. 8 Start with the leaves as they are dark and define the flowers. 9 Paint the flowers or design. 10 Complete the painting and double coat wherever necessary. This project can be completed in a few hours as Acrylics dry pretty fast. Varnish the completed pot, it will take at least 24hrs for the varnish to dry. TIPS- Check out One Stroke Painting videos for learning the strokes and technique. I am a stay at home mom from India with grown up kids , a late bloomer in the field of crafts . My crafting skills had been hibernating for twenty years but now my life has become totally crafty . I take hobby classes and also sell craft items ,orders welcome.